The correct job titles are either “Casting Director” OR “Agent”. Which are two very different jobs. Please Actually READ Your Emails! With internet overload, it has become commonplace for actors to just hit the reply button on emails asking a question that was answered in the very same email they were replying to! Whether you are getting an email from your agent, the PA for your shoot, or even your actor friends, get in the habit of reading and then rereading all the way through before replying with questions. So think before your email! This leads us into another common pet peeve. Actors (and people in general) sometimes just want to be heard. A good rule of thumb is to speak if you have something worth saying. If you don’t … your career will be much better served listening instead. This goes for a lot of situations. In many auditions, actors lingering or asking questions about the script or character AFTER their read is over-extending the connection with the auditors. The information will no longer help and is usually done out of nerves. Please know that most casting directors and other people holding auditions want you to come in, do a fantastic read, and leave. It is important to know that even though your 2 minute read might have been a big point of your day, it might have been the 37th time they’ve seen that same scene in that day. Also realize they want to make sure you will be professional on set. If an actor talks a lot in the audition, it just might make them wonder what that actor will be like on set if hired. How you speak is also important. In an acting seminar with an agent or casting director, sometimes actors give the impression that they just want to ask a question to talk about themselves instead of asking a sincere question of the industry guest. On a phone call to an industry professional, make sure you get to the point quickly. Talking about how you have a cold or had a flat tire or how it’s raining, will not get you any brownie points. That is not to say to be rude of course, just no babbling allowed. Know WHY you are calling, say WHO you are, WHAT you need, and again … get to the point FAST. At parties and other social gatherings, it is also important to ask questions of others instead of talking about yourself. And if you are at a commercial audition where they ask “Tell me something about yourself” or are being interviewed, or are on a red carpet, etc…, make sure to give dynamic, and concise answers. The word “casted” is more often used by beginners, but every once in a while it will be uttered by someone that has been around a while too. 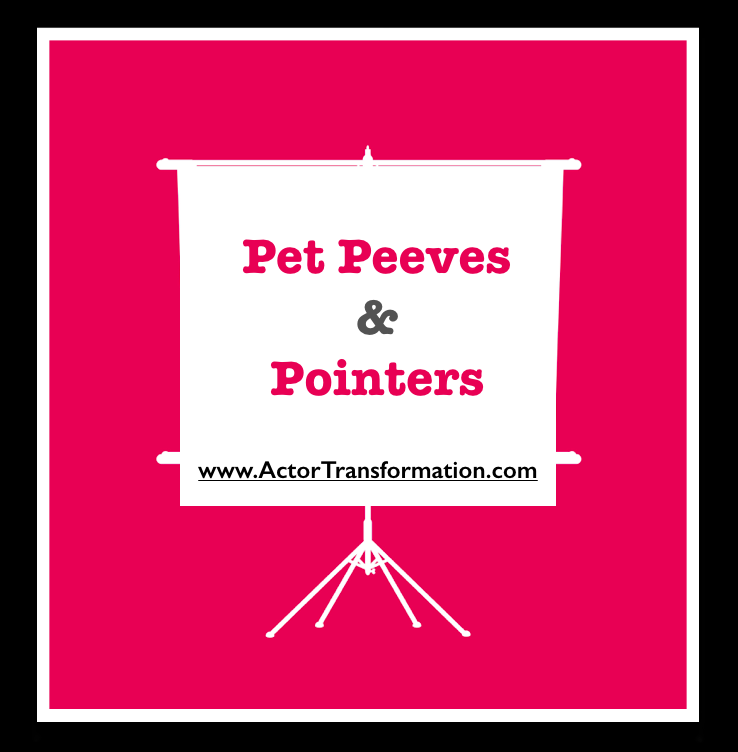 This sounds like a simple one but this is one of the most common pet peeves from agents and casting directors. There is absolutely no excuse for not bringing a headshot to an audition, a class, or a meeting. Even professional actors have been known to say, “Oh… I though my agent sent my stuff over”. At the bigger agencies often do send pics over but the agents often fax over your pic so it showed up black and white and smudged and well… like a fax! You should absolutely bring a headshot and resume on you in the audition room. And there is no reason not to have at least 5 pics and resumes ready to go in your car at all times. Your headshots should be cut to 8×10, (NOT 9-1/2 x 11) and they should not be flopping around. The resume should be securely attached with your contact info on it. Many actors reading this are thinking “Of course, everyone knows that,” yet time after time actors come into meetings and auditions unprepared. It happens enough that this needs to be said over and over again. This is another biggie. Most actors would be shocked to know that they have missed out on auditions and opportunities because they could not be contacted. This happens all the time in Hollywood. If you have representation, you should absolutely have your reps contact info on your resume but you also should have YOUR phone number and email on your resume. Casting directors and agents may debate on this point. But it is vitally important that actors can be reached. Many producers, directors, and casting directors hold on to headshots in their files and if they have your resume from 2 years ago (That only has an agent on file) and you have moved on to a new agency, then YOU lose out. Remember that this is YOUR career. The only exceptions are when an actor is underage or when an actor becomes famous. Parents of minors should include the parents name, number and email. And even famous actors might at least want to have a website or some other way to be contacted. Many agents have turned down roles on behalf of their clients without their clients ever even knowing that an offer was on the table. Sometimes this is a good thing. Sometimes it is not. Please no numbers, underscores, dots, abbreviations, or cute little phrases. Get a professional email for your acting career that identifies you and is easy to find and remember. You can keep 2cute_sweetlips79@university.socal.com for your family and friends if you really need to but for your professional acting career, have a professional email. And for goodness sake, do NOT put your birth year in your email address. It is recommended to include at least your full first name in the beginning of your email for searching purposes. Choose an email address that is clean and simple and makes sense. A huge portion of communication in the entertainment world is now done online. Please make sure that you have an automatic signature in your emails and that your emails reply with the entire conversation in each reply. It is astounding how many emails can be received that just say “sounds great, let’s have that meeting next week” but there is no name , no signature attached, and none of the previous conversation has been included so there is no way to know who is emailing. Remember that busy industry people often get hundreds of emails every single day. You need to be clear in all of your communication. This goes for your voice messages as well. Your return signature should include your full name and phone number. Many actors also like to include their websites or IMDb links as well. If you do not know how to set up an automatic signature and full reply in your email accounts, look it up in your help section or FAQ section on your email account. Many of the recommendations above are tasks that once they are completed, they will help you over and over again. They become automatic. Many more pet peeves and pointers will follow in the future, but for the time being, make sure to take care of these right now. These are just a couple of the ways that you can make yourself very easy to work with and add to your professionalism as an actor!